Last week, Indian voters started casting their votes in the 17th general election to elect a new Parliament (Lok Sabha). In the coming five weeks, nearly 900 million voters will vote to fill 543 assembly seats (Economic Times, 13 May 2019). The 2019 Indian general elections are scheduled to be held in seven phases from 11 April to 19 May, with election results being declared on 23 May. Simultaneously with the general election, legislative assembly elections are being held in Andhra Pradesh, Arunachal Pradesh, Odisha, and Sikkim. Most states complete the voting in one phase, while voting in several states will be spread out over two phases (Karnataka, Manipur, Rajasthan, Tripura), three phases (Assam, Chhattisgarh), four phases (Jharkhand, Madhya Pradesh, Odisha, Maharashtra), five phases (Jammu & Kashmir) and seven phases (Bihar, Uttar Pradesh, West Bengal). Over the coming weeks, ACLED will publish a weekly infographic — the “Indian Election Monitor” — to provide users with quick updates based on data recorded by ACLED. The Indian Election Monitor will be produced for every phase of the seven election phases. Data depicted in the infographic include all events recorded in all states that hold elections in all or some constituencies during each respective phase. The time period used for analysis spans over ten days — seven days prior to election day, election day, and two days post election day. Three actor bar charts identifying violent actors involved in (1) battles and explosions/remote violence, (2) violence against civilians, and (3) mob violence. 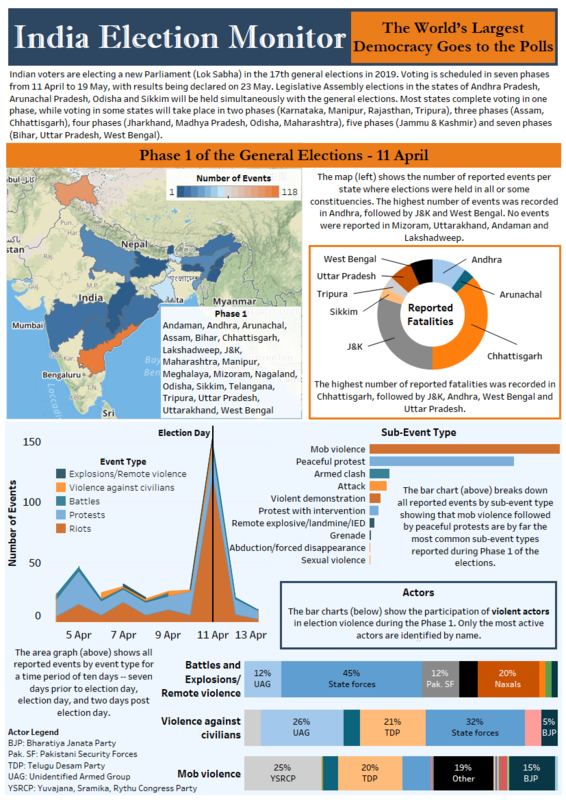 For more information about elections in India, see recent analysis by ACLED on electoral violence in India’s most vulnerable areas, the effect of elections in India, Maoist rebel violence during the state elections in Chhattisgarh in 2018, and election violence in West Bengal.